Berlin-based architects Sauerbruch Hutton have renovated an office tower from the 1950's into a 165,000-square foot office block. The impressive building features a double-skin thermal flue on the west-facing façade, cross ventilation east west and automatically and manually-operated triple-glazed windows with between-pane blinds, enabling the building to achieve energy savings of 30-40 percent. Located in Berlin’s Kreuzberg neighborhood, the GSW Headquarters consists of an ensemble of five distinct architectural volumes. The building also houses Checkpoint Energy, which is the city’s spot for the citizens to consult on energy saving, thermal insulation, renewable energies, switching energy suppliers and more! A non-profit initiative by the Federal Ministry of Economics and Technology and the Consumer Federation, the center — which charges €5 for 30 minutes — gets its own advice from a network of experienced architects, engineers and physicists. Aiming for climate protection and resources conservation, this energy-consulting center is an important step forward towards an energy-conscious future. Located on the Checkpoint Energy’s west side is the GSW Headquarter’s building, which glows in different hues of red and pink. 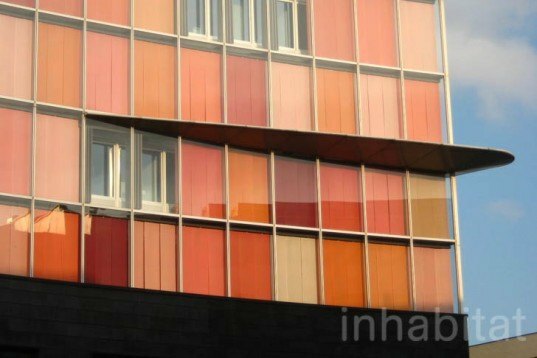 Designed by Sauerbruch Hutton, this passive renovated 22-story office building was designed to get free cross ventilation and passively control its energy usage. It is said to be the world’s first thermally-flued tall building and can have natural ventilation for up to 70 percent of the year, making it more sustainable and economical to run. 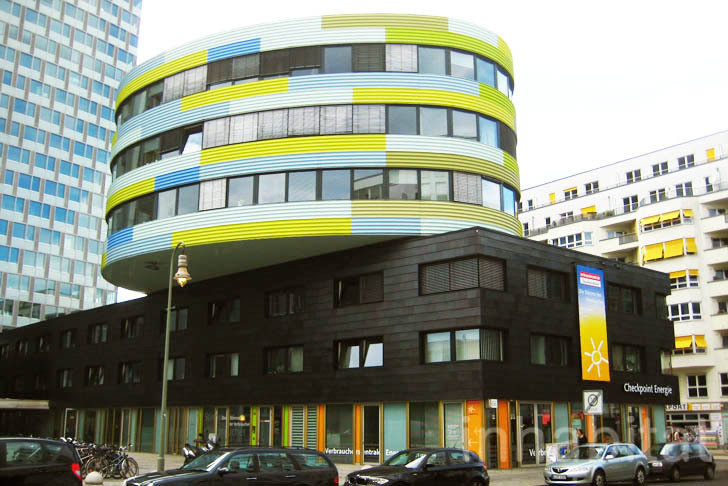 Located in Kreuzberg, Checkpoint Energy is the city's spot for the citizens to consult on energy saving, thermal insulation, renewable energies, switching energy suppliers and more! A non-profit initiative -- it charges 5 Euro for 30 minutes -- the center gets its own advise from nationwide experienced architects, engineers and physicists that give the matter a wide reliable approach. Aiming for climate protection and resources conservation, this energy-consulting center is the reliable companion into an energy-conscious future. Located on the Checkpoint Energy's west side is the GSW Headquarters’ building, which glows in different hues of red and pink. Designed by Sauerbruch Hutton, this renovated 22-storey office building was designed to get free cross ventilation and passively control its energy usage by its top slab. It is said to be the world's first thermally fueled tall building and can have natural ventilation for up to 70% of the year, making it both sustainable and economic to run.